Posted on October 16, 2012 by Elizabeth E.
I present. . . Snapshot! 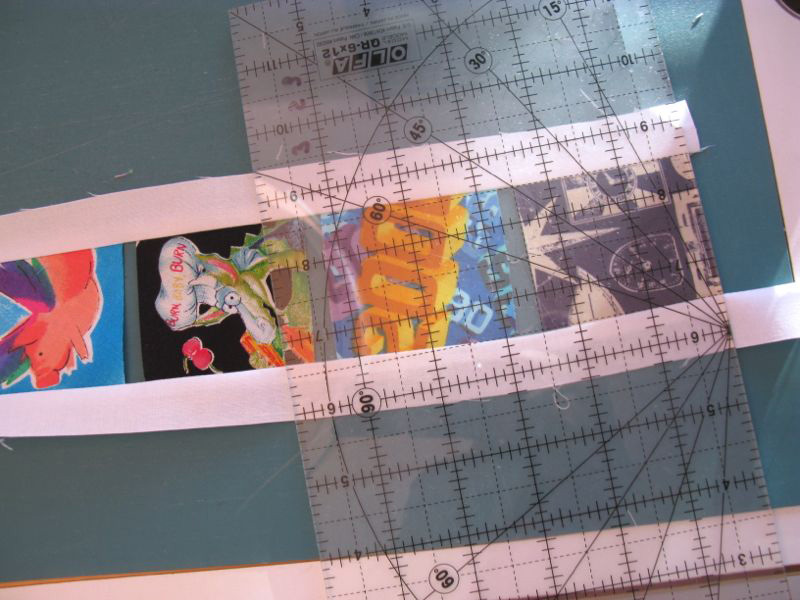 This is where I’ve been for a while, trying to work out the kinks of this crazy idea I had for my Polaroid Quilt Blocks. 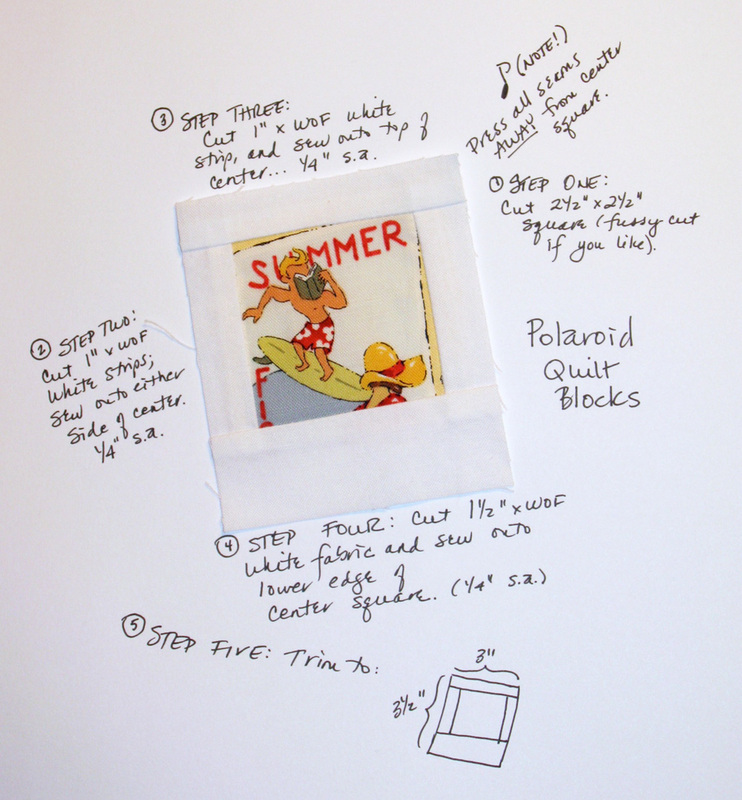 I didn’t use them all, so at the end of this series of how to make this quilt, (it will take a couple of days, sorry–but there are lots of photos), I’ll have a little surprise drawing to get you started on your Polaroid Quilt. Watch for it. It takes just five easy steps, repeated over and over, to get a batch going. And please press all seams AWAY from the center square. I have some fabric in one of my Polaroid blocks, cut from one of my first sewing projects when I was a child–a Barbie doll dress. I found that dress (really nothing more than a tube with gathering for the waist), took it apart and fussy cut a piece from it. So have fun as you gather your centers. As for the white, I used KONA white. I do like KONA’s other neutrals, but this quilt just needed that bright white. 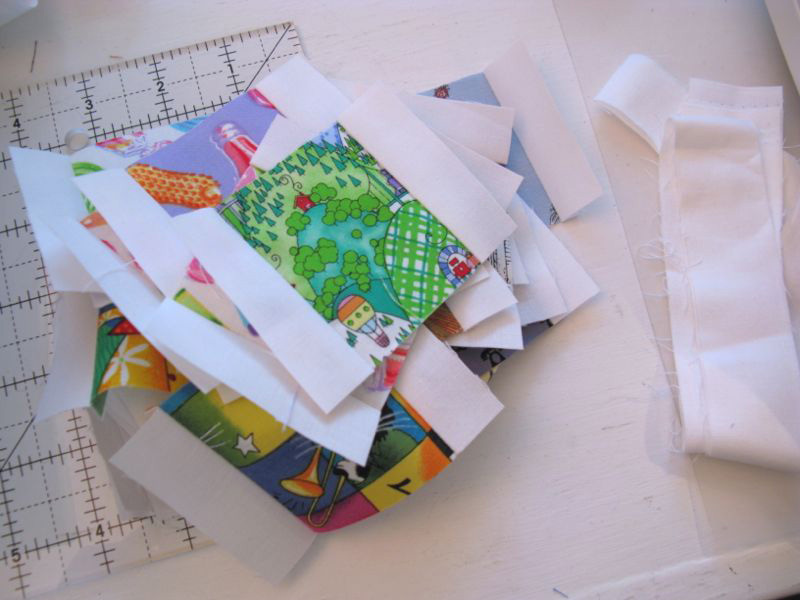 Here I’ve lined up the centers, sewn the 1″ by WOF (Width of Fabric–a shorthand way of saying, cut a strip from selvage to selvage) on one side, then the other and now I’m cutting them apart. And. 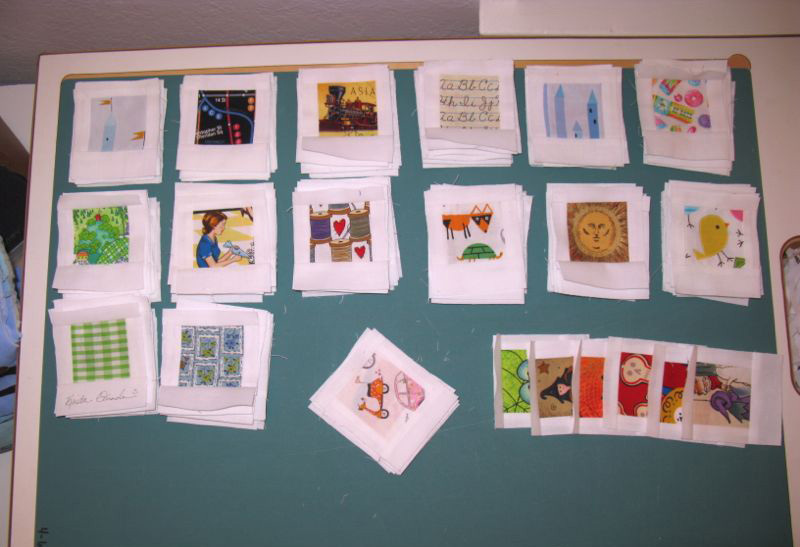 . . here I’m trimming them down to 3″ across by 3 1/2″ in length. 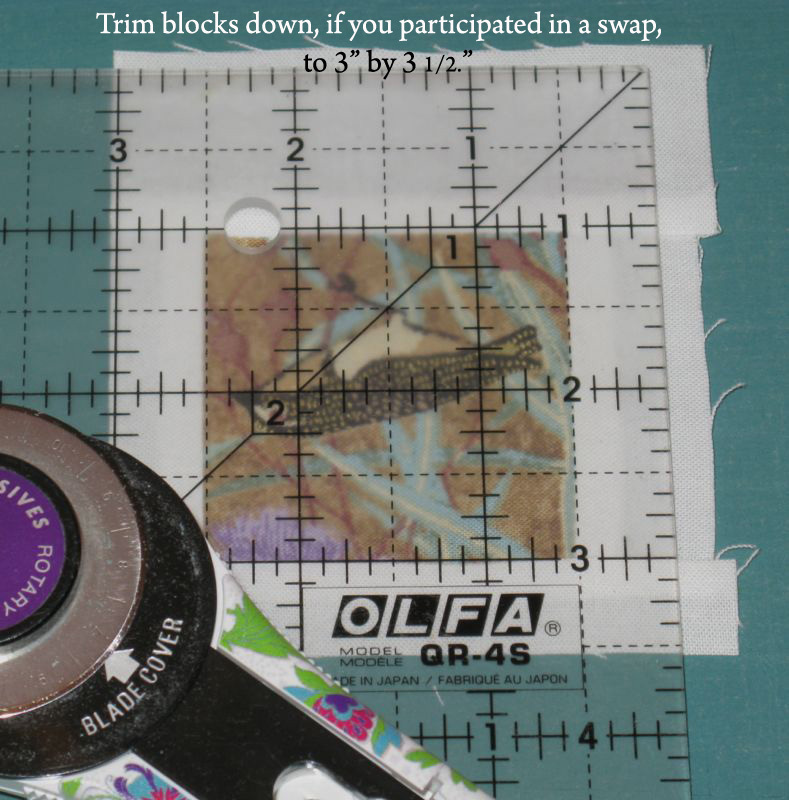 I’m using the center block as my guide, placing the 1″ mark of the ruler on that edge (note that my blocks are upside down), then centering the ruler for the 3″ in width. Press them all again. One quilter’s blocks were starched pretty heavily and hers didn’t ravel as much as the others, so if you like spray starch, now’s a good time. NOTE: Sorry to be so inexact; I’ve measured and measured and this is what I’ve come up with (well, actually I’ve come up with that you need 31″) but I don’t want you to run out of fabric, so get that extra. 1 and 1/2 yards–you are buying for the length. If you don’t care to put your border on the straight-of-grain, buy 1/2 yard. I used a yard of fabric, but ended up piecing it, so if you want it all in one piece, buy at least a yard and one-half. You MUST cut this on the straight of grain for the center strips of the quilt and the first borders. 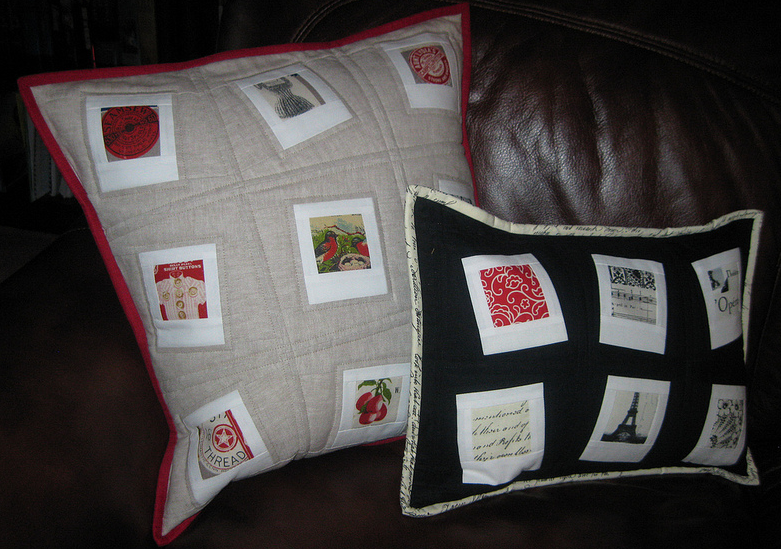 The joined quilt blocks are all slightly skewed off grain and you need something to stabilize them. So buy about 2 yards white, but MORE if you are going to buy for the Polaroid blocks (and you’re on your own for that one). But peeeples! You NEED a good white fabric hanging around your sewing room, so do what I do: buy it in five-yard lengths. I should really do what Cindy does: she buys it by the bolt. Now print out these two PDFs: one is “right-leaning,” and the other is “left-leaning.” rightleaning leftleaning Just keep them hanging around until you need them. Next post I’ll start on the construction of the blocks, but here’s a couple more pictures of my Snapshot quilt lounging around the backyard. For some reason, our summer just won’t quit. Here in Southern California we have something called the Santa Ana winds, and they are hot blowy hair-dryer-feeling winds that come out of the desert. It makes us all cranky to be doing HOT SUMMER, when everyone else is doing pumpkins and fall leaves and crisp apples. But it does make for nice pictures of quilts, resposing on the rose bushes, which still have blooms. NEXT UP: Constructing the Double-Polaroid Blocks. This is really beautiful! I wish I’d gotten in on that swap! This is phoptperfect…what a great IDEA and your green accents …perfection! SO cute! I’m bummed I only have 25 blocks. I should start making some more! Elizabeth, this is absolutely stupdendous – zaney brainey!!!! Love, love the look and the idea will go in my to-do box. Have started mentally collecting “things” to polaroid – just have to get through the current load. Thanks so much for the tips – you are SO good about that. It’s so fun and causes the eye to keep moving. Great piece! 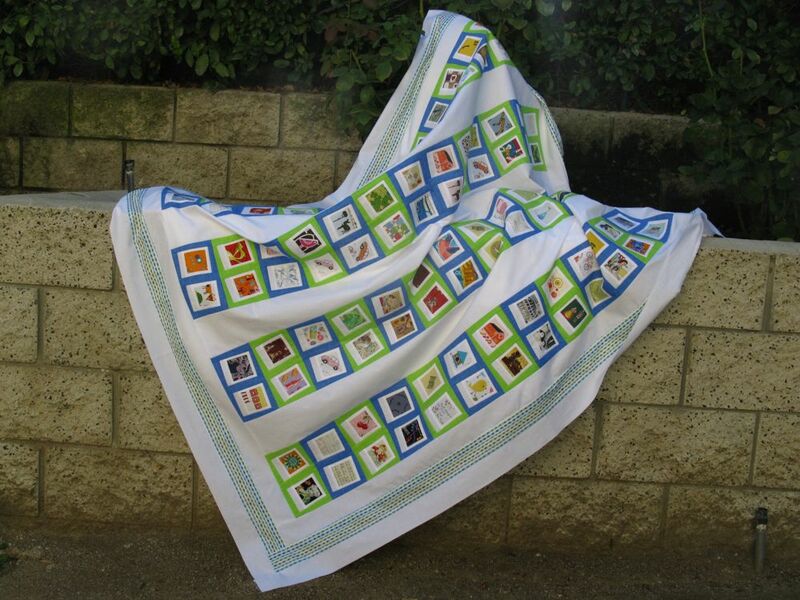 I so love your quilt…the colors are “picture perfect” (excuse the pun)! Thank you for the instructions, too! What a fun way to use the blocks, I love it. Love your version of the Polaroid quilt! Thanks for sharing it in such detail! I love your layout and think the Polaroid blocks are so fun… Thanks for showing us how it’s done! 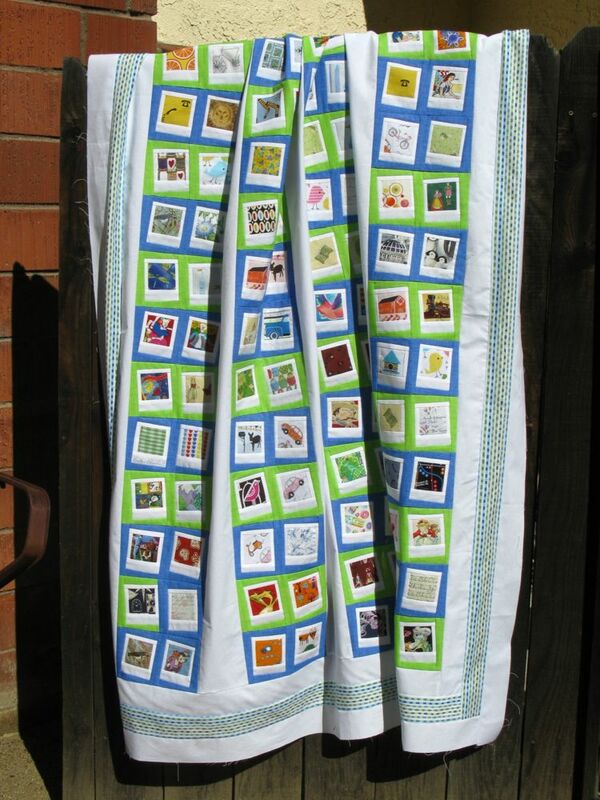 Fantastic quilt! Suburb tutorial! Love the detail! Visiting from WIP Wednesday! This looks really great! I am going to make one similar. I just framed a bunch in blue, and now that I’ve seen this, I’m going to do some in green too. This is my first quilt for a boy who is not a little baby, since I have three daughters, so I am trying hard to make something boyish! 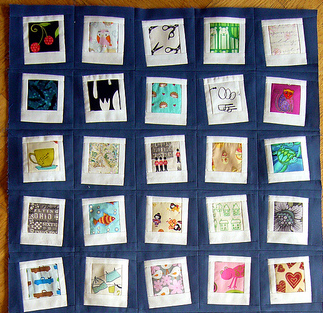 Pingback: Snapshot: Polaroid Quilt finished | OccasionalPiece--Quilt!